• Protect your property value. Your home is an investment. If your project or repair does not comply with the Building, Mechanical and Plumbing Codes in effect, your property value can decrease. • Property insurers may not cover work or damages caused by work done without permits and inspections. • Avoid problems at sale of property. When you sell your home, you must disclose improvement or repairs made, and whether you obtained permits and inspections. Many financial institutions will not finance a purchase without proof of a final inspection. If you decide to sell a home that had work done without a permit, you may be required to tear down the work, leave it unoccupied, or do costly repairs. • Stay safe and healthy. Your permit allows the code officials to reduce hazards of unsafe construction, providing for public health and safety. Mandatory inspections, coupled with the contractor’s experience, are a system of checks and balances, resulting in a safer project. 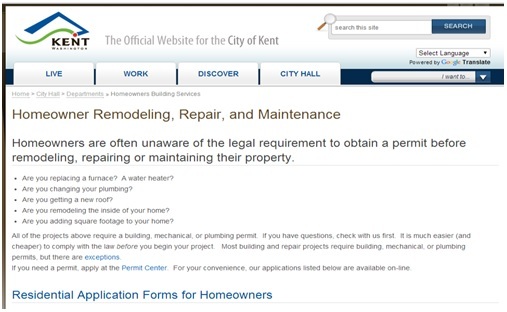 Securing permits is one of the most basic ways to ensure the quality of roofing in Kent. They outline a base safety standard that everyone should adhere to. Though some people may complain that getting permits is a waste of time, the above benefits speak for themselves. If you’ve ever been a victim of shoddy workmanship or low-quality parts, you probably have a better understanding of the need for consumer protection. A house is an investment, and the purpose of maintenance, repair, or remodeling is to maintain or increase the property’s value. An unlicensed project may lead to counter-productive results and prospective buyers may turn away from a property if they think it’s unsafe due to non-compliance with building codes. A trustworthy roofing contractor in Kent will not work on a house until the proper permits are secured because he/she ought to understand that customers deserve only the best service. The city government’s standards exist for consumer welfare, so you should only hire companies like Tedrick’s Roofing that are fully-licensed and aware of all the necessary requirements.